This project aims at extracting models of human joints in a data driven manner. This is done in collaboration with the biomechanics group at the TU Delft, where experimental setups have been instrumented to apply force and position disturbances to joints (ankle, wrist and shoulder). Based on measurements of the force and position, the mechanical impedance of the joint can be estimated. The dynamic properties of a human joint are continuously modulated by the central nervous system, to be adapted to the task at hand. For instance, while walking, the leg is stiff during stance phase and slack during the swing phase. The perceived impedance of the joint are a.o. determined by the joint angle, muscle activation level, and muscular fatigue, all of which are variable in time. From a dynamic systems' perspective, this means that the system is time-varying. the design, tuning and control of prosthetic and orthotic devices, to adapt their dynamic properties and mimic the intended human joint behaviour. Preliminary results for the identification of the time-varying wrist joint have been obtained, by using the skirt decomposition method, and a kernel based parametric method . 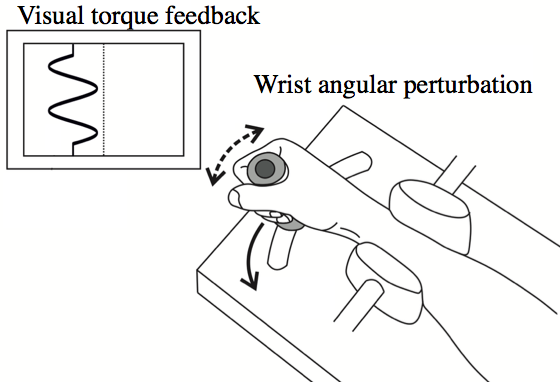 They were applied to angular and torque measurements on a human wrist, to which an angular position perturbation was applied, see left figure. The human subject was requested to follow a sinusoidal force trajectory (facilitated via visual feedback on a screen), which resulted in a fairly controllable time variation of the muscular properties. 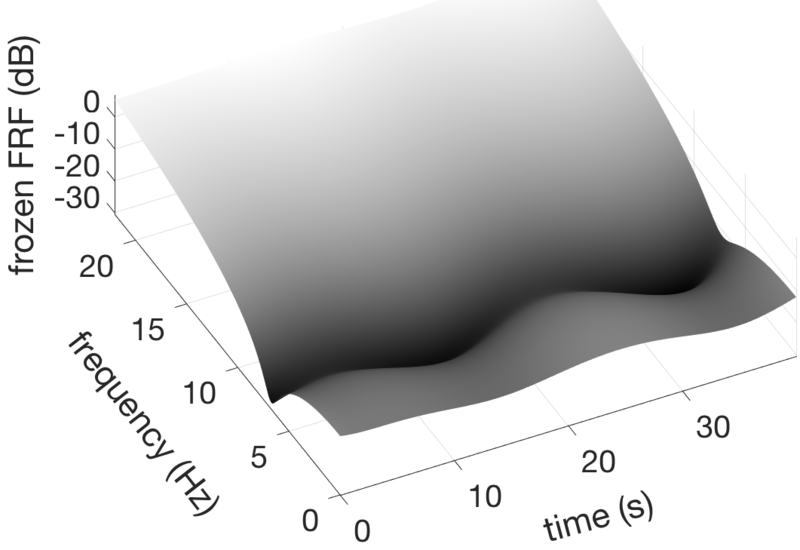 The skirt decomposition method allows to extract a nonparametric model of the time-varying impedance of the system. This gives an estimate of the evolution of the resonance frequency (middle figure), which is related to the evolution of the stiffness of the muscle. The kernel method gives a parametric model, thus giving a smoother result, in which the sinusoidal variation of the stiffness is clearly visible, in the right figure. W. Mugge, A. G. Munts, A. C. Schouten, and F. C. Van der Helm. Modeling movement disorders—CRPS- related dystonia explained by abnormal proprioceptive reflexes. Journal of biomechanics, 45(1):90–98, 2012. J. Lataire, R. Pintelon, and E. Louarroudi. 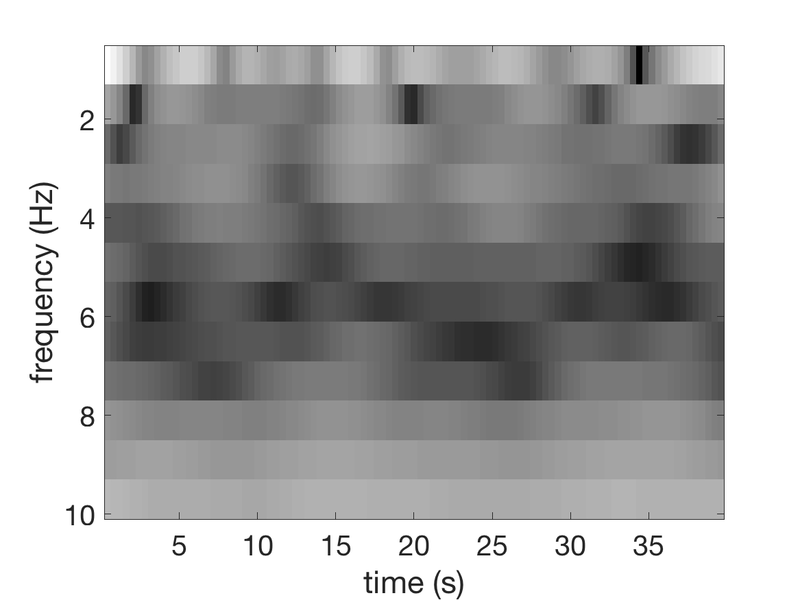 Non-parametric estimate of the system function of a time- varying system. Automatica, 48(4):666–672, April 2012. J. Lataire, R. Pintelon, D. Piga, and R. Tóth. Continuous-time linear time-varying system identification with a frequency-weighted kernel based estimator. IET Control Theory & Applications, 11(4):457 – 465, 2017.